ED1 monoclonal antibody recognises a single chain glycoprotein of 110 kDa that is expressed predominantly on the lysosomal membrane of myeloid cells. Weak cell surface expression also occurs. The antigen is expressed by the majority of tissue macrophages and weakly by peripheral blood granulocytes. Studies have shown that the antigen recognised by ED1 is the rat homologue of human CD68. 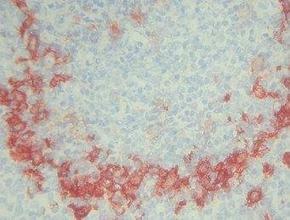 ED2 antibody reacts with a membrane antigen (175, 160 and 95 kDa) on resident rat macrophages. Monocytes, dendritic cells (spleen and lymph node), peritoneal granulocytes and other cell types are negative. ED2 discriminates between thymic cortical (positive for ED2) and medullary (negative for ED2) macrophages. 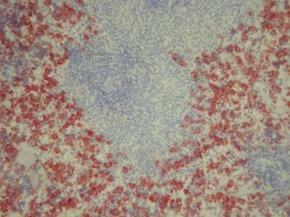 It is useful to stain synovial lining cells and Kupffer cells in the liver. The antigen has been shown to be identical with CD163. ED3 recognises the rat CD169 cell surface antigen, a 185 kDa molecule expressed by macrophages, predominantely confined to lymphoid organs only. Monocytes and granulocytes are negative for ED3. No other cell types are positive. The most conspicious property of ED3 is that it stains marginal zone macrophages and marginal metallophils in the spleen very strongly. Furthermore, macrophages in (auto-immune) diseased tissues express the ED3 antigen. In healthy tissue no expression occurs. CD169 is a receptor for glycoconjugates containing sialic acid. All ED clones can be used for histochemistry and flow cytometry applications. RM1 antibody recognises a surface antigen of unknown function on monocytes, macrophages, interdigitating cells and their in vitro equivalents. The antigen is found on a subpopulation of most tissue fixed macrophages. It is quite predominant on red pulp macrophages and interdigitating cells in the outer periarteriolar lymphatic sheath of the spleen, the inner border of marginalsinus of lymph nodes, and alveolar macrophages. 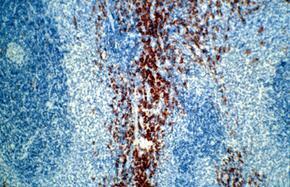 Langerhans cells of the skin and twisted spindle-shaped cells of the omentum are detected by the antibody. RM1 is absent from sinusoidal endothelial cells and parenchymal cells. Ki-M2R is an antibody that recognizes typical tissue macrophages and specifically discriminates between monocytes (Ki-M2R-) and macrophages (Ki-M2R+). It stains all resident macrophages including those of bone marrow, lymphatic sinuses, lymphoid follicles, splenic red pulp and Kupffer cells in the liver. 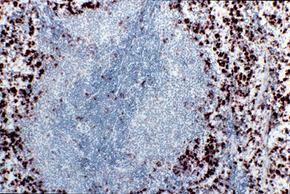 Langerhans cells, interdigitating reticulum cells and dendritic reticulum cells of lymphoid follicles are not stained. Ki-M2R is a reliable tool for indicating macrophage differentiation in vivo and in vitro. TRPM-3 is a specific cell surface marker useful for the identification of tissue fixed rat macrophages and macrophage subpopulations. It is particularly suitable for phenotyping macrophages of lymphoid organs, where it reacts with marginal zone macrophages and with marginal metallophils. It is also an interesting marker for studying autoimmune diseased tissues. The antigen is comparable to the one recognized by clone ED3. Reinhard Schneider et al. : Low-dose indomethacin after ischemic acute kidney injury prevents down regulation of Oat1/3 and improves renal outcome. Am J Physiol Renal Physiol, Dec 2009; 297(6): F1614-F1621. Valeria Ramaglia et al. : The membrane attack complex of the complement system is essential for rapid wallerian degeneration. Neurosci, Jul 2007; 27: 7663-7672. Dijkstra, C.D. et al. : The heterogeneity of mononuclear phagocytes in lymphoid organs: distinct macrophage subpopulations in the rat recognised by monoclonal antibodies ED1, ED2 and ED3. Whiteland, J.L. et al. : Immunohistochemical detection of T-cell subsets and other leucocytes in paraffin-embedded rat and mouse tissues with monoclonal antibodies. J Histochem Cytochem, 1995; 43: 313-320. Polfliet, M.M.J. et al. : Identification of the rat mature macrophage antigen ED2 as CD163: Regulation by glucocorticoids and role in the production of pro-inflammatory mediators. PhD Thesis. Vrije University, Amsterdam, 2002. Takeya, M. et al. : Heterogeneity of rat macrophages recognized by monoclonal antibodies: an immunohistochemical and immunoelectron microscopic study. Histochem Cytochem, 1989; 37: 635-641. Wacker, H.H. et al. : Ki-M2R a new specific monoclonal antibody, discrimates tissue macrophages from reticulum cells and moncytes in vivo and in vitro. Leuk Biol, 1985; 38: 509-520. Takeya, M. et al. 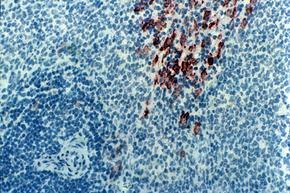 : A new monoclonal antibody, TRPM-3, binds specifically to certain rat macrophage populations: Immunohistochemical and immunoelectron microscopic analysis. J Leukocyte Biol, 1987; 41: 187-195.